If you have been following along then you know our love of the Instant Pot and the ability to make great desserts quickly. We started with the Triple Chocolate Cheesecake, then whipped up a Pumpkin Cheesecake for Thanksgiving. It only seemed logical that we continue with Christmas. We tested this recipe a few times and had a few different results based on the chocolate used. When I used a high quality European chocolate we had a few problems with the chocolate seizing up and texturally it was wrong for a cheesecake. After a few experiments we ended up going with Ghirardelli White Chocolate Chips . Since we were using them for the white chocolate we the figured that we may as well use their Peppermint Bark also. By all means you could easily make your own bark and use in the recipe. Just make sure the peppermint is finely chopped. When the recipe specifies melted white chocolate, just melt it a bit in the microwave. Enough to melt the chips but it doesn’t need to be over heated to boiling hot. White chocolate is delicate and overheating it results in a horrible texture. For the crust we used the entire Oreo. Filling and all. I kept the crust low instead of running the crust some up the sides. I just wanted a little more elegant look. But if you don’t care about that and just love Oreos, then run some of the crust up the sides like our other instant pot recipe calls for. We used a six quart Instant Pot to make the recipe with a 7-Inch Round Springform Pan. And from past comments we learned that not all 7″ pans are the same height. So just make sure not to overfill your pan. I used the entire recipe in my pan with no spill overs. But if your pan is a bit shorter, make sure to leave some room for the cake rise so you don’t have spill over in the pot. We also made the mousse the next day. You could make it the same day just make sure the cheesecake is cold before putting the mousse on top. This makes a great Christmas day dessert or would be a crowd stopper for any event over the holidays. I also found that if a clean cut is what you need for presentation, we froze the cheesecake for about an hour after putting the mousse on. I have to photograph it and clean cuts are super important for the visual. But if you want to cut small pieces and want them to be beautiful, this helps with the cut. I hope you enjoy the recipe as much as we do. Please share if you end up making this. We would love to hear how it worked for you. Pour the crumb butter mixture into the bottom of the pan and pat until even. Put in freezer for 10 minutes. In a food processor, mix the cream cheese with the sugar. Once combined, add eggs one at a time followed by the egg yolk. Stir in the peppermint bark by hand. Cover cheesecake loosely with a piece of foil to prevent moisture from getting on to the top of the cake. Set Instant Pot to maximum pressure for 27 minutes. In another bowl, whip cream cheese until smooth. Add chocolate and peppermint extract. Spread onto the cheesecake and let set. Under cheesecake, you list the first ingredient as being 1 pound (16 ounces) cheesecake. Am I correct in assuming you mean 1 pound (16 ounces) of cream cheese? Yes, corrected thanks so much! I’ve eaten a wide variety of cheesecakes, but never have I heard of this! It sounds so delicious! I seriously never would have thought to use the insta pot for desserts! I love peppermint cheescake, but I have never baked it before. This is so simple to make. Please share if you give it a try. This is the prettiest cheesecake! It sounds absolutely wonderful and I love peppermint flavor this time of year! I look forward to Christmas for peppermint ALL year. I haven’t made cheesecake in the Instant Pot yet but this is so on my list! Me too! I don’t know why I don’t just use peppermint all year long, but I keep limiting myself to December. Kind of like pumpkin in November. I can’t believe you made this in an INSTAPOT! It looks nothing like those other ‘crockpot’ cakes, etc I’ve seen. This is gorgeous. I am really in love with this dessert. It’s Christmas rolled into one beautiful cheesecake! I can only imagine how good it tasted! I would love to make this or try to make it! I think I just died and went to heaven. Saw this on Insta this morning and immediately called my girlfriend and said nexts girls night we are making this. Cheesecake is my favourite. I love the holidays. I get to see great recipes like this one. Definitely something I would love to eat. So I’ve fallen in love with this, and am so going to try it. Thanks for the tips on the chocolate to use. I’m a big fan of Ghiradelli chips. This is crazy cool, how awesome is that you can make something this tasty in an Instant Pot. It looks incredible and just lick your fingers clean. I know right?!? I was skeptical when I got it, but really love using it. Anything with ghiradelli chocolate is amazing but I think this recipe just leveled up to its pure awesomeness. I am just drooling looking at the recipes and ingredients. I cannot wait to make this. That certainly looks like something you’d get at Cheesecake Factory. Yum! And you made it look so pretty. I’m not a huge fan of cheesecake normally. But once you add peppermint bark, I’m more than sold! this is what dreams are made out of! Could you bring this to my house? LOL! All my neighbors get to taste test along the way as we develop these recipes. I shared this recipe on facebook and my husband was like why are you not making this right this second??? Thanks for the idea. This looks so delicious! I have been debating on getting myself an instant pot, but I think I really do need one! Last years Black Friday was the deal that sealed it for me. Oh my, layers and layers of goodness right here. What a festive dessert. Love it! This is inspiring me to finally break in my Instapot! What a mouthwatering looking cheesecake! This is definitely going on my to-do list for the Christmas eats. And thank you for the tip and how to melt the white chocolate, I would have overdone it if you hadn’t mentioned it. Enjoy! Please share if you end up making it. If I could get Instant Pot for Christmas, I will definitely be making this during this holiday week. What a lovely and festive recipe! I didn’t realize you could make desserts in an insta-pot. 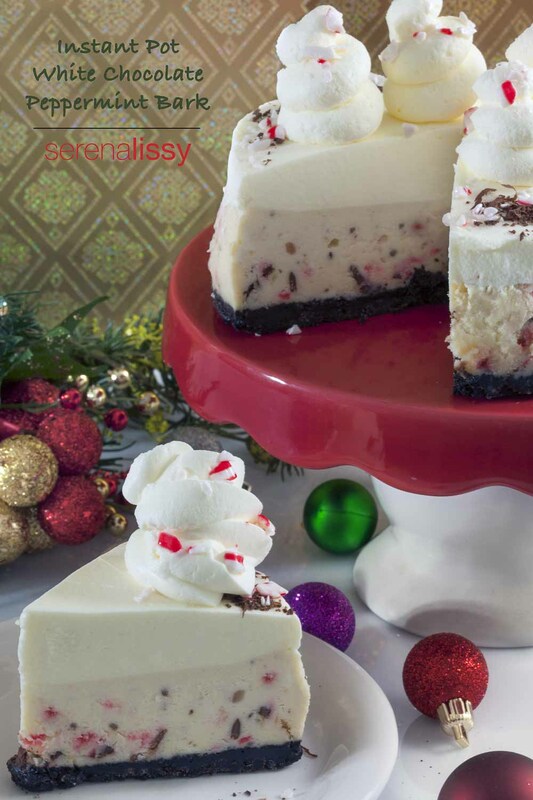 That is amazing, especially when you can create a peppermint bark cheesecake. I’m obsessed with peppermint bark this time of year. I’ve only used my instant pot for desserts. You can do so many yummy things in them. I always forget that I can make desserts in the Instant Pot. I absolutely will be trying this soon!! 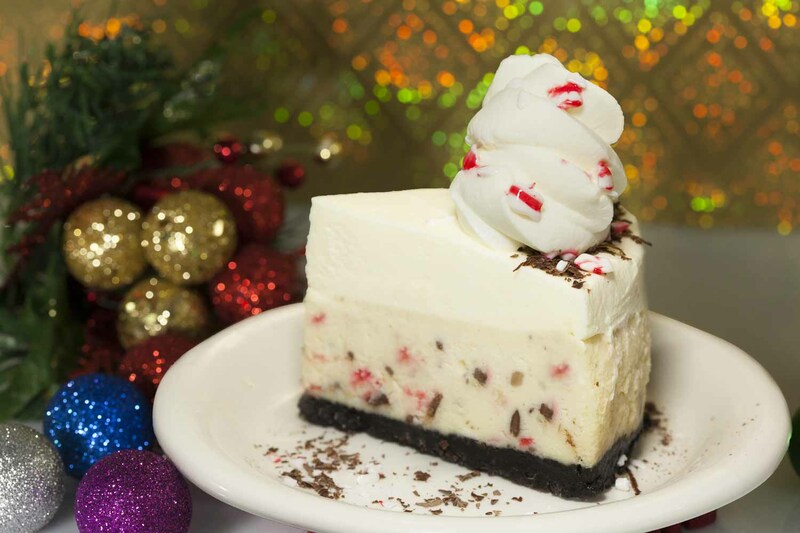 Two of my favorite things: peppermint bark and cheesecake combined! I will definitely be trying this recipe!!! You had me had cheesecake, but wow, I have never tried anything like this before. Thanks for sharing this amazing recipe! This is my first cheesecake that I have ever made. When do you take out of the pan? Leave it in fridge after cooking overnight then remove from pan the next day. I am confused about Hotpot. Is this a crockpot or some type of Fast cooking pot ? It’s an instant pot. Basically an electric pressure cooker. Is this a really dense cheesecake? Hi! I pinned this last, but didn’t get around to making it. I’m definitely making it this year, but was hoping to clarify the directions. It cooks for 27 minutes on high pressure and then you let the pressure naturally release for 15 minutes? Thank you! Looks delish. 😋 Been looking for an IP Peppermint Cheesecake recipe that used peppermint bark vs hard peppermint candies. While researching recipes saw another used mint Oreos as the base. Do you think using mint Oreos as the base along with the peppermint bark would be too strong of a peppermint flavor? Thanks. No I think it would be a great combo!